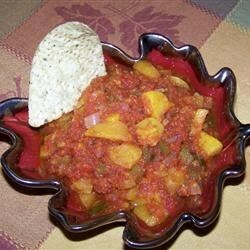 "This nice and fruity salsa has a kick. A slightly-underipe peach gives it a bit of crunch. Serve with corn chips or spoon onto hamburgers. Try vodka in place of the tequila for a different flavor." Toss together the canned peaches, fresh peach, onion, habanero pepper, and cilantro in a mixing bowl; stir. Pour the lime juice, tequila, and olive oil over the mixture and mix well. Season with salt and pepper. Cover; refrigerate overnight or 8 hours before serving. Very good! I doubled the peaches (used only canned) and reduced the tequila & habanero, but it was not too spicy. Could use full amounts next time. Added a bigger can of peaches, rinsed & patted dry. This recipe was phenomenal!!! Hot & amazing!! Had 4 people try and it nobody liked it. We make a lot of salsa's and found this one kind of bland. Tequila didn't help it at all and we love our tequila.